Tour de France green jersey winner Mark Cavendish is expected to take part in the London-Surrey Cycle Classic race on Sunday August 14, the test event for the 2012 Olympic Games road race. Although the start list has yet to be confirmed, Cavendish is provisionally down to be taking part alongside several other big names representing their home nations at the 140km (87 mile) event on closed roads. Matt Goss (Australia), Tom Boonen (Belgium) and Filippo Pozzato (Italy) are all expected to take part. The race starts and finishes on The Mall, London, through Hampton Court Palace and then south to the lanes of Surrey where two laps around Box Hill will be completed before returning north to London. Organisers hope that the event will help iron out any problems encountered on the route before the Olympic Games in 12 months time. National teams will also be keen to use the race as a valuable reconnaissance mission. Twenty eight teams of five riders will line up to contest the event – 148 riders in total. Teams are a mixture of national squads and British trade squads. In addition to a Great Britain team, British Cycling will include an ‘England’ team to field the maximum possible number of riders. 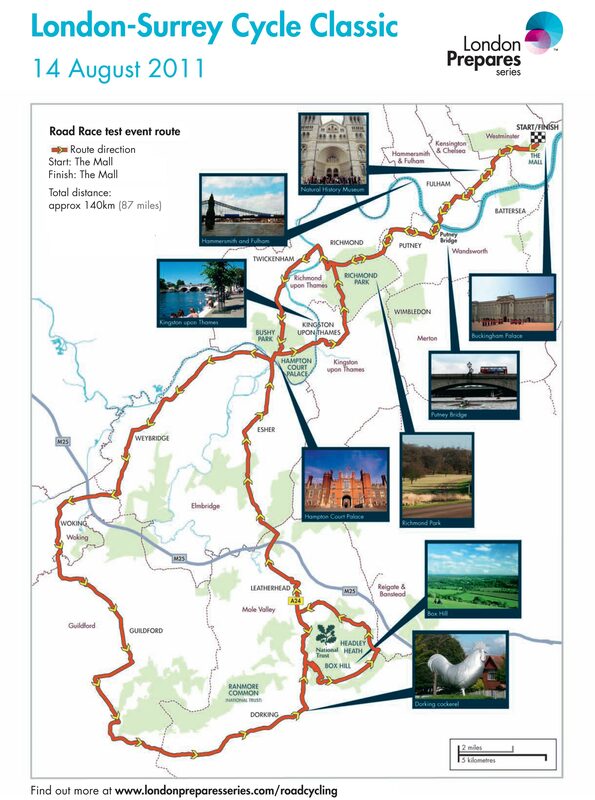 The event will be free to watch, but there will be limited access to Box Hill and the start/finish area on The Mall. Spectators wishing to access these areas will have to apply for a wristband – and organisers are asking fans to avoid Box Hill all together. Details of the route can be found below. Cavendish became the first British rider in history to win the Tour de France points classification, winning five stages of the 2011 race and bringing his career total of Tour stage wins to 20. If Cavendish does ride the Surrey event, he will use it as part of his build-up for the 2011 Road Race World Championships in Copenhagen in September. He also ranks as one of the favourites for the Olympic Games road race title in 2012. Spaniard Samuel Sanchez is the reigning men’s Olympic champion.